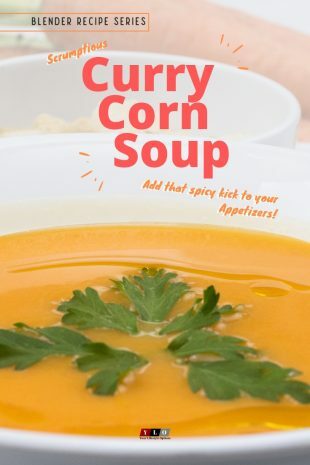 Corn soup has been a well loved classic dish of every home for centuries. It brings warmth and comfort with every slurp. Here we share a wonderful twist to this classic dish by adding Curry. Still smooth and scrumptious with a spicy kick bringing a whole new adventure to your palate. Enjoy! Combine the corn, onion, and milk in a medium saucepan and bring to a soft boil. Cover the saucepan, and bring the heat then allow it to simmer for 20 minutes. Pour into a blender and buzz until nearly smooth (if you have a hand blender, you can do so directly on the saucepan and skip the pouring). In the same saucepan, heat the butter and add curry powder cooking it gently for 3 minutes while stirring. Add in the corn mixture, salt, cream, and pepper. Stir constantly as you allow the heat to meld everything together. Scoop a taste and add more seasoning if necessary. Pour on a white plate for serving and sprinkle parsley on top.